Just in time for Valentine’s Day, these Easy Dark Chocolate Truffles will make your sweetheart swoon…only four ingredients to truffle heaven! We interrupt this alternating presentation of whisky reviews and baking recipes posts to bring you a second recipe post in a row…Easy Dark Chocolate Truffles. The mathematician in me is aghast at this disruption of a predictable arrangement, but hear me out…next Thursday is Valentine’s Day, and I wanted to make sure you’ll have this recipe in time to make for someone special (even if that’s yourself). I’m sure the Math gods will forgive me. These Easy Dark Chocolate Truffles are reminiscent of the Chocolate Cake Pops I made last year around this time, and that’s no coincidence…it’s another one of Sally’s Baking Addiction baking challenges timed for Valentine’s Day. I like to participate in these baking challenges because (1) Sally does a great job in explaining the recipe with clear instructions and great tips and tricks, and (2) it allows me to riff on the recipe to explore my creativity (you’ll remember last month’s baking challenge was when I made Sourdough Bagels…good times). Basically, truffles are just chocolate ganache made creamier with added butter and flavored with pure vanilla extract. They’re rolled into balls and coated with some sort of topping or dipped in tempered chocolate to keep them from sticking to your hands. Because there are so few ingredients, you have to make sure you’re using high quality chocolate (for the best taste) and real heavy cream (anything less won’t set correctly). And you can vary the flavorings…this time instead of making just one truffle flavor, I used vanilla, peppermint extract, and, just for fun, Irish whiskey (like to complicate things, do we?). Let’s see how it went…as it usually the case, my comments are in italics below. Place the chocolate in a heat-proof bowl. Set aside. Heat the heavy cream until it is simmering. You can heat it on the stove or in the microwave. Add the butter, if using, to the chocolate and pour the heavy cream evenly on top. Let the warm cream and chocolate sit for 5 minutes. Add the vanilla extract and stir until the chocolate has completely melted. Place a piece of plastic wrap directly on the surface (to avoid condensation) and refrigerate for 1-2 hours. Tip: Pour into a flat shallow dish, such as an 8 x 8-inch baking pan, so the mixture evenly and quickly sets. Roll each into toppings, if desired. Cover tightly and store truffles at room temperature for 3-4 days or in the refrigerator for up to 2 weeks. Truffles taste best at room temperature. Chocolate: Use pure chocolate, the kind sold in 4 oz bars in the baking aisle…the higher quality chocolate you purchase, the better your truffles will taste (I used Trader Joe’s 72% Pound Plus bar). Don't use chocolate chips...semi-sweet or dark chocolate (my choice, obviously) make a very intense chocolate truffle and milk chocolate yields a sweeter truffle. Also, don't use white chocolate in this recipe because it's too thin. Heavy Cream: Heavy cream or heavy whipping cream is the only liquid that will melt the chocolate into the proper truffle consistency. Do not use half-and-half or milk. The only non-dairy substitute is canned full-fat coconut milk (not the refrigerated kind). Shake it up and use in the recipe as you would heavy cream. Halved/Doubled: Recipe can easily be halved, but Sally doesn’t recommend doubling. Instead, make 2 separate batches. Freezing Instructions: For longer storage, freeze up to 3 months with or without toppings. Thaw in the refrigerator, then bring to room temperature, if desired, before enjoying. The chocolate won’t melt: Make sure you chop the chocolate into very small pieces. The finer the chocolate chunks, the quicker they’ll melt. Additionally, the chocolate might not melt because the cream is not hot enough. Make sure it is simmering warm before pouring over the chocolate. If the chocolate still isn’t melting, place the heat-proof bowl over a pot of 1 inch of simmering water and stir until melted. The ganache won’t thicken: Make sure you are using pure chocolate, not chocolate chips, and heavy cream. You can also pour the mixture into a shallow dish so it thickens quicker. And finally, keep it in the refrigerator until thickened. 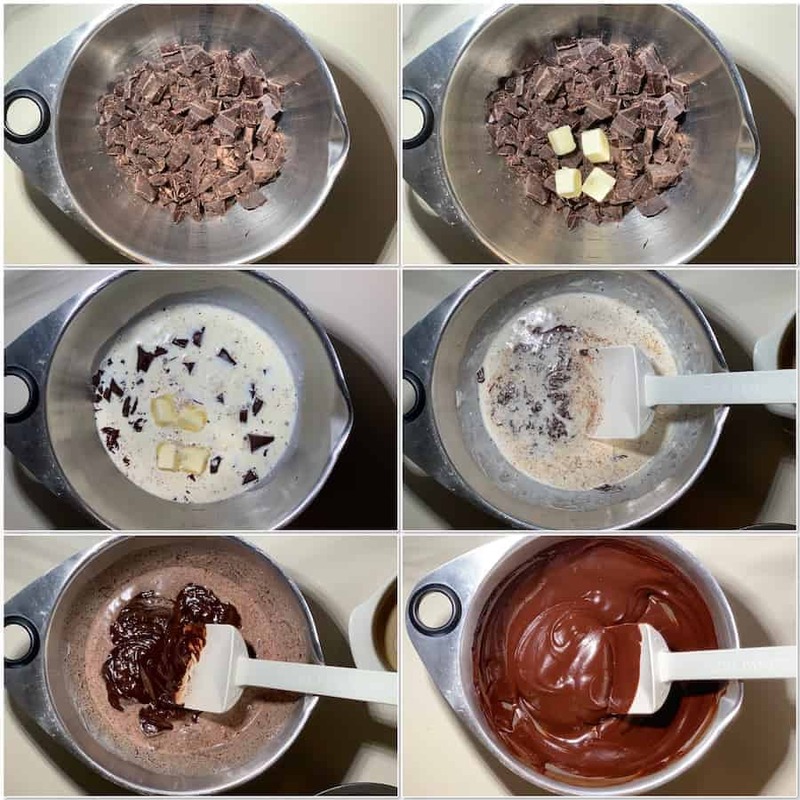 The chocolate is greasy and separating: If the truffle mixture is greasy or separating, the heavy cream was too hot. The truffle mixture is too sticky: Scoop the truffle mixture into mounds on a lined baking sheet and refrigerate for 20-30 minutes so the mounds “dry out.” After that, they are a little less sticky to roll. Also, you can wear rubber gloves (what I did) or coat your hands in cocoa powder. Rolled truffles are too dry for toppings: Mash the truffle between your palms and re-roll so it’s sticky enough for the toppings. Making the ganache…don’t worry, it will come together just fine! I made one batch of the ganache (that’s all the chocolate I had), separated it into 3 parts, and adjusted the amounts of flavorings accordingly (1 Tbsp whiskey, ½ tsp vanilla, and ¼ tsp peppermint extract). In order to tell them apart, the whiskey truffle went into cocoa powder, the vanilla truffle went into chopped almonds, and the peppermint went into sanding sugar. 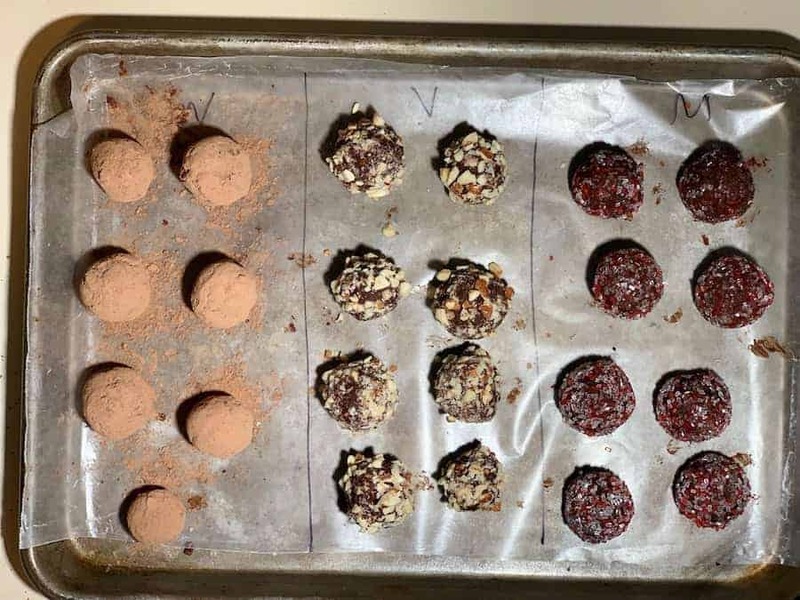 And how did these Easy Dark Chocolate Truffles taste? Well, all three flavors started with a lovely, creamy dark chocolate base. The Irish whiskey didn’t flavor the truffle as much as amplify the flavor profile of the chocolate itself (reminding me of Bourbon Brownies. [Side note…next time I might try bourbon, Kahlua,or rum instead…Irish whiskey might be too delicate a flavor to shine through, being overbalanced by the dark chocolate itself.] Peppermint Extract tends to be tricky to work with…too much and the flavor goes from pleasant to bitter, and to me this was just on the cusp of happening (that’s why I used the sanding sugar as a topping, to sweeten it up a bit). My favorite was the vanilla truffle because it really brought a richness to the party (that’s why vanilla is added to so many desserts, I guess). Overall…all three flavors were luscious in their own way, and ready to be served to my special sweetheart next week. That’s the best reason to interrupt a pattern if there is one!